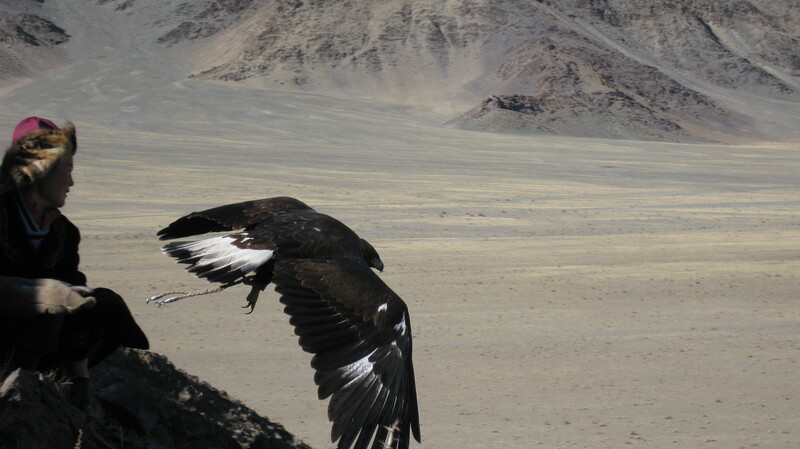 -The Golden Eagle Festival has been the largest gathering of eagle hunters and their eagles in the world since it started in 1999 with 70 eagle hunters participating in this event. It is recognized as a UNESCO World Heritage Cultural Event. The festival starts with display of eagles and hunters, and then goes into the events of eagles displaying their talents. 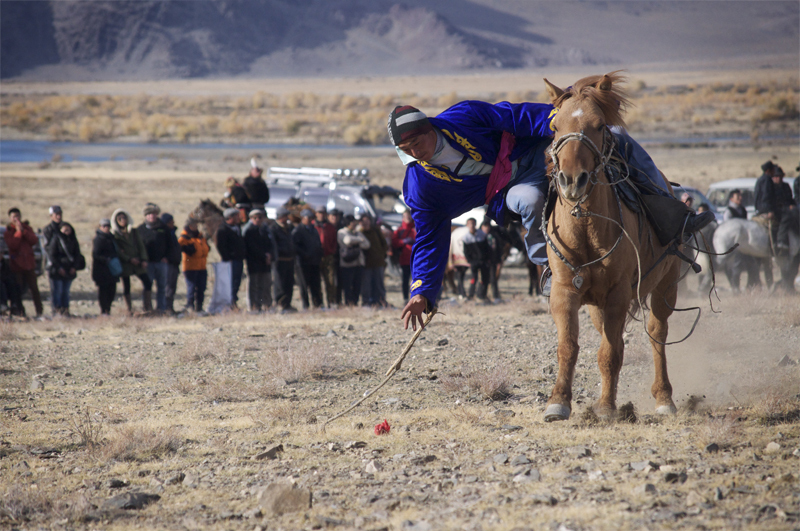 The first event is the eagle catching fox skin dragged behind a horse, returning to their owner from a distance on command, as well as a camel race and Kazakh games of Tiyn Teru (a race to pick up a coin on the ground while on horseback), Kyz Kuar (“girl chase,” a man and woman race on horseback while the woman whips the man), and Kokpar (tug of war over a goat carcass while on horseback). On the evening of the first night is a concert of traditional Kazakh music at the theatre included in the price of a ticket. Prizes are given to the winner of each event plus prizes for best dressed man, woman, and child. The finale is a live hunt of a fox or cub wolf by the winning eagle. The event is run by the Berkut Association, a local community organization for eagle hunters, and is sponsored by Nomadic Expeditions. Traditional Kazakh craft work and food is available at the event. Options to get to the event are a shuttle bus from Ulgii by Kazakh Tours (5,000 MNT) or taxi (10,000 MNT). 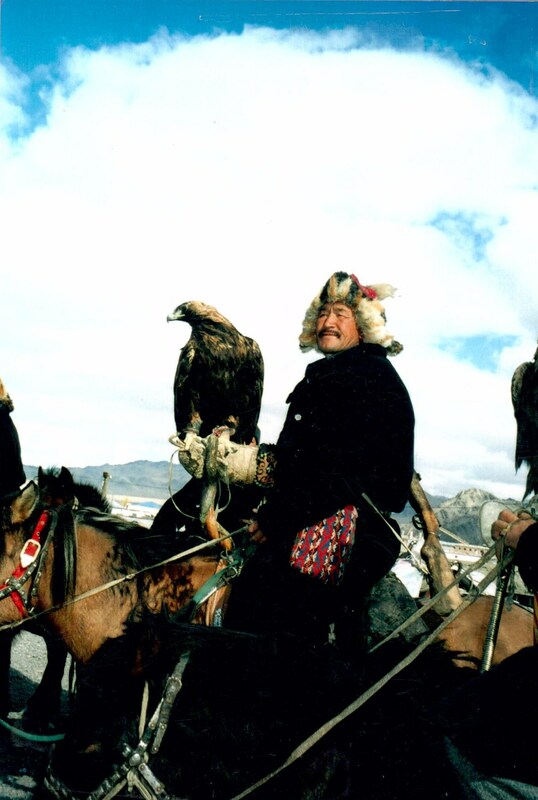 The eagle festival is a cultural event that is not to be missed. I love it. I am interested in the eagle festival 2016. Could you tell me where u stayed …was it at Ulgii? Were u with a tour group? This is what we live for.. The Eagle festival never disappoints! This is remarkable!!! As well I’ve learned that a young girl wants to become the first female to win it!! Beautiful the paths we take to become who we are in this life! Anymore, becoming the first is becoming a challenge for firsts!! Just saw the movie The Eagle Huntress. It was a wonderful depiction of the sport and culture involved. Two generations of family were totally supportive and they all believed that women could do anything men do if they set their minds to it and our thirteen year old huntress did it ! No female had ever participated in the festival before. I am so excited to learn about this amazing tradition. I am happy that it is getting well-deserved attention but I hope it stays authentic. I hope I can attend it soon. Thank you to your association and all of your supporters. that’s one of things that i wish to see oneday! could anybody please tell me how I can get an invitation from locals to get visa? I’m from the state of Montana..would really love to come see and possibly stay with a family for a week to take it asll in. Plrase get back to me with info or suggestions. Hi guys, i would like to come very much, but iam wondering if i can cross the bulgan border to china as a foreign tourist. Its hard to find information i think. Does somebody know something? As long as you have a valid visa for China, the Bulgan border in Hovd is open. Hello there , I am Lum in Singapore. Came across some read out of eagle hunters in your country and was very impressed from what i have read. I wish to have the opportunity to take pictures of man and eagles in your impressive country one day.Whatever information you can provide me with regards to eagles and man would be much appreciated. Thanks and best regards. So neat how man and animals interact with each other,I had a wild North America Golden eagle land on my arm.I held my arm out,and it flew to me.